Q: How many creeks does my house make in one night? A: That depends if Eric is home or not! Yes, that’s right folks. I made it a night…on my own, without the manly man. Eric stayed at his brothers last night as he was helping him with renos. Friday night was a fun girls night! There was a horrible plot twist about two thirds into the movie and then it ended with a huge thud. However, Krissy and I are very excited for the Valentine’s Day movie next week!!! I think it will be fun! 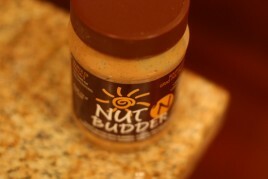 Congrats to the winners of the Nut ‘n Budder giveaway! Tons of great book suggestions! Please email me (angela [at] ohsheglows.com) with your mailing address! So as I mentioned, I tossed and turned all night with the empty bed and creepy noises. However, I did have good dreams…dreams of homemade cereal, that is. It dawned on me that I have never made my own homemade cereal before, so off I was to the kitchen to do some testing! Directions: In a small bowl mix everything together. Pour onto a cookie sheet lined with parchment paper. Break up into chunks with a spoon and flatten with a hand as if you were making flatbread. Cook for 30-50 minutes at 325F, being sure to check half way through and adjust cooking time if necessary. 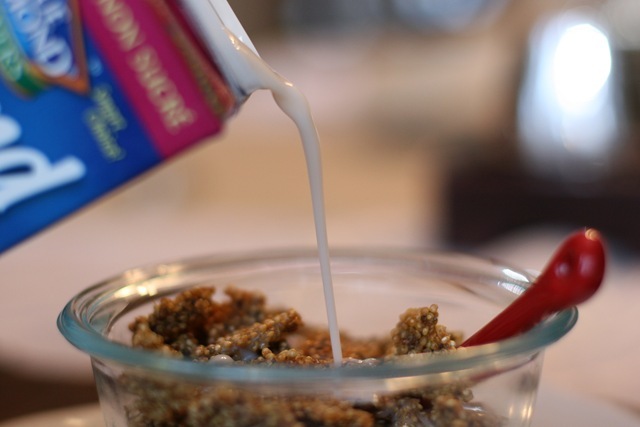 Flip cereal around with a spatula for more even cooking. Cereal should be slightly golden brown when finished. Remove from oven and cool. Enjoy in a bowl with your favourite milk + toppings over top! This cereal is amazing!!! High in protein and fibre too (approx 12 grams protein and 8 grams fibre for the entire recipe- without the chia seeds). Slightly sweet, very crunchy, and it stays crunchy even when in milk. The best part about the recipe is that you can tailor the baking time to suit your needs- soft or crunchy. Personally, I love my cereal crunchy! I also had a lovely GLOWING ORANGE fresh juice made with carrots, ginger, and grapefruit to go with it. I think this is my favourite juice. I’m off for my scheduled 3 mile run and Booty Booster workout. Then, I have a house to clean. Not sure what is on the agenda for tonight yet. I also added more Adore (S’more) Glo Bars and some X’s and G’los Valentine’s Day packs to the shopping cart. I am almost out of my S’more ingredients so if you want some, order them soon as I am not sure when the next order will be in. That looks delicious!! I might even make it this morning! Love the crunchy quinoa cereal! definitely going to have to try that one out. I really liked how they made The Notebook into a movie. Most people disagree with this, but the book was SO LAME. The only reason the movie was so good was because they took out some really dumb parts in the book. Nicholas Sparks books in general are really really cheesy. Have you seen the movie Nights in Rodanthe? Also really bad. I have heard the book is much better than the movie though. I LOVED The Notebook movie…have seen it several times! I also enjoyed the book too. Dear John didn’t even come close to the notebook. I haven’t seen Nights in Rodanthe though. I liked the Notebook! I was looking forward a little bit to Dear John! Too bad it was a dud! I’ll probably see it anyway! I will say The Notebook has been the best movie version of a Nicholas Sparks book. A Walk to Remember… eh not great, neither was Nights in Rodanthe. This cereal looks great! I have both quinoa and chia seeds on hand, so I need to try it…do you think honey would work, or do you definitely recommend maple syrup? 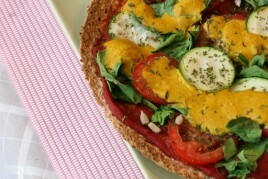 I’ve tried two of your recipes in the last few days (pumpkin quinoa and the ‘cheesy’ pizza) and loved them both. Your blog was one of the biggest influences in me starting my own! Thanks for all the great tips! 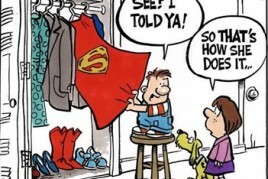 I think honey should work too! I could just be naive, and I haven’t seen Dear John yet, but I personally feel that unless you read the book the movie is going to disappoint. The book’s ending has the same terrible plot twist and ending, so it’s no surprise the movie did too. Plus the book “Dear John” wasn’t as good as the book “The Notebook”. Even though they’re both written by Nicholas Sparks, it’s definitely not apples to apples. I find that I am always even more disappointed when I read the book first, and then see the movie. The only exception being The Notebook…every other time I have read the book first I was disappointed with the movie. One example was Marley and Me- LOVED the book, did not care for the movie as much as the book. I just bought a bag of quinoa, and now I know what I’m going to do with it! I would have neverrrr imagined quinoa for breakfast, thanks for the recipe!! The cereal looks wonderful! Have a great workout! I am going to go see Dear John tonight. I read the book and I really enjoyed it. I hope the movie lives up to my expectations! That cereal would be perfect raw, made with sprouted quinoa instead of cooked. :) I think I will give it a try! Thanks so much for the cereal recipe! I am a cereal addict but am tired of looking for tasty cereals where the main ingredient isn’t sugar (and that doesn’t cost a fortune). Can’t wait to try this! 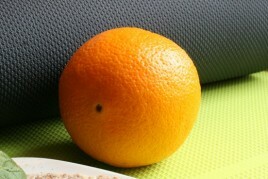 You may have mentioned this somewhere in your blog but what of juicer do you use?!?! I am wanting one, but want a good one that is going to work before I spend the money. Your juices look soo yummy…THANK YOU!!! I think it would be hard to top the Notebook…sorry the movie sucked! I’m like you with scary noises in the house–just get a dog (or two) and you’ll sleep like a baby, even when alone! The Notebook is my fiance’s favorite movie. He actually owns the DVD :) What a softee! I loves it too. That cereal looks amazing! Have a wonderful Saturday, and say hi to Sketchie! I am EXTREMELY upset about Dear John. I too thought that the critics must be overreacting but after hearing bad things about it from everyone, I must admit that it must be… well bad. I will still probably rent in when it comes out on DVD just because. But I can’t wait for Valentine’s Day!!!! And kudos to you for staying alone. I HATE staying alone. Freaks me out. You are so creative in the kitchen! Did your house spring a leak? Enjoy that run and Booty Blaster! I would never think to make my own cereal, you have the best ideas!!! My house makes noises too and I hate it! Looks like you made it through the night though. :) That granola looks awesome, what a great idea. I was hoping Dear John movie would be good. I read the book last week…it was really good, not your typical romance with a typical happy expected ending. I am sad it didn’t make a good movie. But really, who can top Allie and Noah?? If you haven’t read the Notebook, it’s a quality fiction, even better than the movie! I loved the book Dear John so much. I read it in one day. I still want to see the movie, but usually the movie versions don’t compare to the books. Would you mind sharing the amounts of each ingredient in your Glowing Orange Juice? Thanks! Oh and I must make that cereal tomorrow! 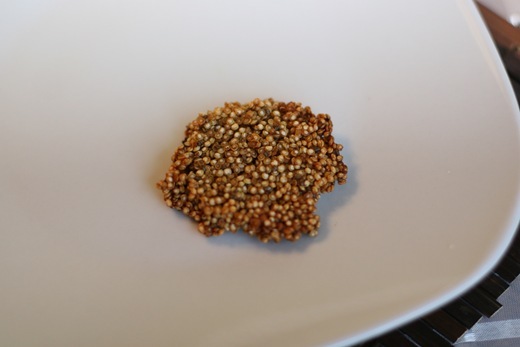 Quinoa is one of my favorite grains of all time! 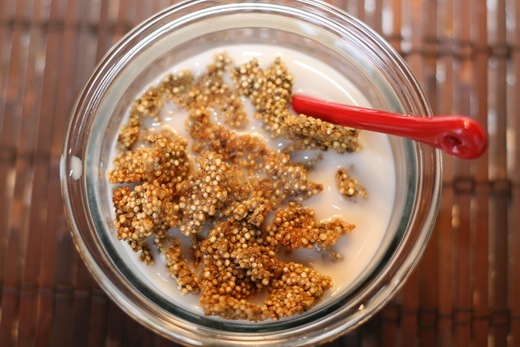 I actually really love quinoa and steel cut oats together (equal amounts of each)…I mix in vanilla, cinnamon and golden raisins then pour some almond milk over top…delish! tiny piece of ginger (little goe a long way)- mabe 3/4″ x 3/4″? Of all your great recipes I think I love this one the most. I am getting a bit tired of oatmeal and I can’t eat most cereals so this will really work for me! I am definitely going to try it ASAP. PS – I’ve been alone for the last 4 nights (4-year-old was with me though) and I couldn’t sleep well either! I am excited for the Valentine’s Day movie as well! There are soo many well known actors in it! That homemade cereal looks delicious. I may just have to try making it! Thanks! Hi- I’m so glad I found your blog! I feel like your running plans/philosophy are very intune with my own, as I’ve been injured many times so have been forced to rethink how often I can run. Btw, I read “Dear John” and it was alright, a classic Sparks book- very, very sad! I love the film version of “The Notebook”! I noticed the lack of chemistry when I first saw the trailer for Dear John, so I was never really gung-ho to see it! I felt like I was less of a girl for feeling that way too, haha. I mean, after Noah and Allie – no one can ever compare! I cannot wait to make quinoa cereal. It looks SO. GOOD! Oh well, I too am looking forward to Valentine’s Day! The Notebook is the saddest movie ever. I ncry uncontrollably at the end, and need to be consoled for hours afterwards! I usually watch it once a year, thats all I can handle. That juice looks fantastic. I must also make that quinoa cereal. You always come up with such great recipes. Ok, you make the most fabulous foods i’ve ever seen! I’ve been following your blog for about a week and I seriously love everything you’ve posted. That looks amazing!! I’ve been trying to find ways to eat chia seeds without that vaguely slimy texture and cant WAIT to try it!! I am going to make that juice – I love ginger! that cereal looks great! it looks just like a cereal i had while in peru. i’ve got to try it. I really liked Dear John! I wasn’t expecting to even compare to the notebook going in to it because I had read the book and knew the stories were pretty different. I do agree that the acting was quite bad at times, but I still enjoyed it! I have got to bust out my juicer! Thank you for the inspiration. Aww, I like Dear John. Not quite as good as the book, but close! I love quinoa! This looks awesome…must try it out! Yum! This looks delish…and it is so creative!!! Made your cereal this afternoon with black quinoa I had on hand. It is really good all by itself! Thank you for the inspiration. I have to make that ceral, it sounds so yummy. Thanks for this quinoa granola recipe! I haven’t had granola in a very long time due to some allergies. I’m always looking for new ways to enjoy quinoa. 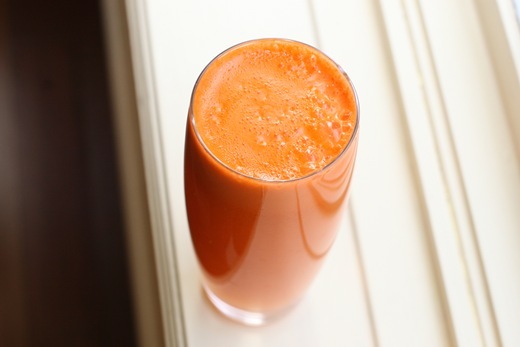 Okay so first — that juice sounds fab, and the color is amazing! So bright and happy! and that cereal sounds amaaaaaazing. I really, really want to try it. Thanks for the cereal recipe! I tried it last night and it was PERFECT this a.m.! I forgot the salt, but it has a great flavor and texture regardless. Oh my gosh. I think you just made my life with that cereal. I haven’t even tried it yet and I can tell it’s going to be THAT GOOD. You are a culinary genius, woman. OH MY LORDY!I just baked this ,and it is absolutely delicious. I’ve been searching high and low for a home-made cereal that is healthy and satisfying, this is it! I’ve finally found THE ONE! Angela, you are one amazing woman, you have no idea how much you have helped a poor student like me save a little cash , as I dont have to spend a fortune to buy imported organic whole wheat cereals anymore! THANK YOU!!! Going to make this tonight with leftover Quinoa! Hopefully storing it overnight won’t ruin it for the AM. One question, is this recipe for one serving? :) Thanks! Great recipe idea! How long do you think this could keep for in the fridge / not? I made this last night and added toasted coconut! It was delicious this morning with fresh blueberries! 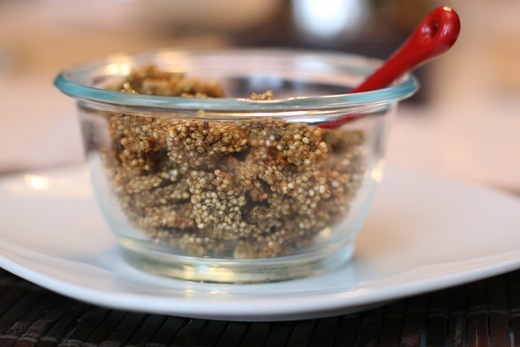 I’ve tried this three times with baked quinoa… should I try with raw quinoa? 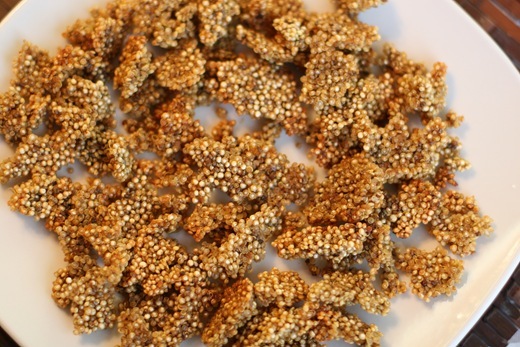 It’s never crunchy or in distinct crunchy quinoa chunks… help please! HI Mike, I’ve only tried it with cooked quinoa before, but you might be able to get away with using a mix of the two. 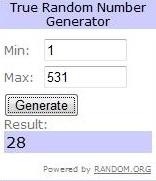 goodluck! How many servings does this make? Just one? Im sorry I cant remember, it’s been so long! I’d guess 2 servings. I know this is an older recipe, but hoping you can help me….I tried to make it last night and wasn’t able to get nice clusters like your version. HOWEVER, I left out the chia seeds because I didn’t have them. So I’m wondering if they work to soak up some of the moisture and help the cereal clump up? Thanks!